Ashokarishta benefits include its strengthening action on uterus. It improves ovarian functions, helps to normalize heavy flow during periods, and reduces pain during menstruation. It also improves appetite. In addition, it is also prescribed for bleeding piles and anorexia in female. Its main indication is heavy bleeding. It is effective in all underlying causes of heavy bleeding except uterine cancer. Ashokarishta (also spelled as asokarishtam) is an ayurvedic liquid medicine. It may contain about 3 to 9% self-generated alcohol. 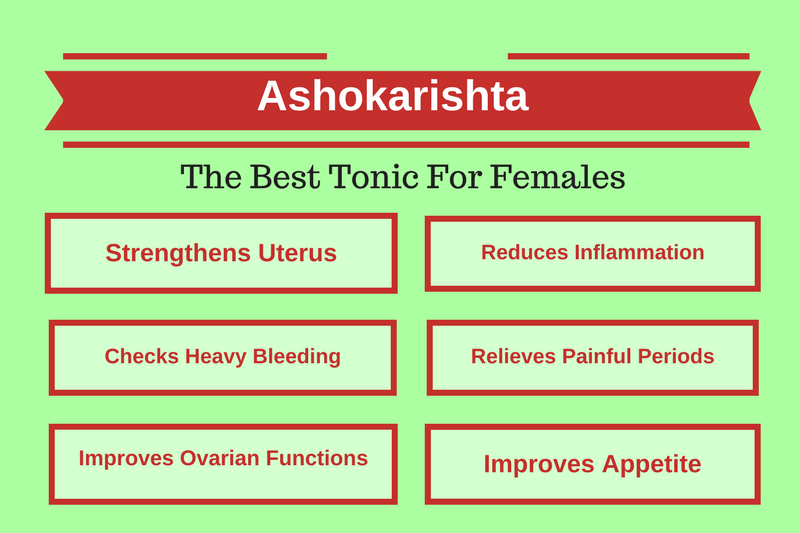 Ashokarishta tonic is almost effective in all types of diseases related to female reproductive system. Ashokarishta is useful in gynaecological diseases including heavy uterine bleeding, heavy menstrual periods, imbalanced female hormones, menopausal osteoporosis, ovarian cyst and uterine polyps. Main ingredient of Ashokarishta is Saraca asoka (Ashoka) bark. Ashokarishta (asokarishtam) contains following ingredients. Ashokarishta (asokarishtam) has following healing properties. Ashokarishta is helpful in following health conditions. Ashokarishta has benefits in ovarian diseases and uterine disorders. Its main function is on female reproductive system and it balances the hormones levels in the body. In menopause, it helps adapting the body according to natural process occurring in the woman’s body. Let us discuss about the main health benefits and medicinal uses of Ashokarishta. Menorrhagia is abnormal heavy or prolonged periods or menstruation. Metrorrhagia is prolong and excessive uterine bleeding. It does not occur due to menstruation. It indicates some other uterine disease. Menometrorrhagia is a combination of menorrhagia and metrorrhagia. In this case, heavy bleeding occurs regardless to menstruation. It occurs irregularly than usual. In ayurveda, Ashokarishta is a drug of choice all these three conditions. It naturally reduces bleeding and regulates the uterine functions. The effects may be due to influence of Ashokarishta on the female hormones. If bleeding occurs due to other causes including cervical cancer, uterine cancer and uterine polyps, Ashokarishta alone may not work well. There are several other medicines may also require for controlling other associated conditions. These ayurvedic remedies include the use of chandraprabha vati, Kanchanar guggulu, Chandrakala Ras etc. In Menorrhagia, some patients also have constipation. In this case, they also require Dantyarishta with Ashokarishta. If patient has main concern of pain, then Gokshuradi guggulu is given along with ashokarista. Ashokarishta is a uterine tonic, which improves uterine functions and modulates uterine contractions. It gives strength to the uterus, which helps in easier dislodging of the uterine lining during menstruation and prevents ischemia (inadequate blood supply to the uterus). Thus, it reduces menstrual cramps. Additionally, Ashokarishta also reduces premenstrual headache, nausea, low backache etc. The effect of Ashoka Bark (main ingredient of Ashokarishta) on raised prostaglandin is still unknown, but phytoestrogens (which are also present in Ashoka Bark) modulate the production of prostaglandin. Prostaglandin level is raised in cases of primary dysmenorrhea. Ashokarishta alone is more beneficial when a woman has heavy bleeding with cramps like pain. If menstrual flow is inadequate or reduced, then Ashokarishta should be taken in reduced dosage i.e. 5 ml to get its strengthening benefit along with Kumaryasava (in dosage of 20 ml) twice daily. If pain is severe, then Yograj Guggulu (500 mg) can also be taken along with this combination. If abdominal tenderness is also present, or other increased Pitta symptoms such as increased bleeding, burning sensation, vertigo, hyperacidity etc. are observed, then Kumaryasava should not be used. Instead, Praval Pishti, Sutshekhar Ras, or Kamdudha Ras should be used along with Ashokarishta in appropriate dosage according to the history of menstrual blood flow. Note: However, many ayurvedic doctors use Ashokarishta as a main remedy for dysmenorrhea, but it is not. Actually, it is a supportive medicine in dysmenorrhea, which assists to maintain the hormonal balance and provides strength to the reproductive organs. The primary medicine for dysmenorrhea in Arishta & Asava preparations is Kumaryasava, but it is contraindicated in symptoms of increased or aggravated Pitta. Ashokarishta is useful in Polycystic Ovarian Syndrome (PCOS). The condition of its use is very different, so it must be used with very care. If your periods last for 7 days or more and you experience heavy bleeding, or you have early menstrual period and periods may also be regular or irregular, but comes before due dates, then Ashokarishta is helpful. The condition is Menorrhagia i.e. heavy (excess bleeding), prolonged or irregular periods, then Ashokarishta is very useful. Sukumaram Kashayam and Chandraprabha Vati should also be used along with Ashokarishta. Chandraprabha Vati and Sukumaram Kashayam both help to restore the ovarian functions. If your periods are irregular and comes after due date, then Ashokarishta is contraindicated. In such case, Sukumaram Kashayam along with Kumaryasava and Chandraprabha Vati is helpful. In such cases, some may also require Agnitundi Vati or Rajahpravartani Vati (Raja Pravartini Vati). Ashokarishta also has influence on endocrine system. The hormonal disturbance is common cause of excess hair growth, acne and weight gain. The regular use of Ashokarishta with Chandraprabha Vati helps normalizing the hormone levels and treats all PCOS symptoms, but you should remember the condition of its use. Low-grade inflammation may stimulate ovaries to secrete more testosterone, which may cause hair growth. Low-grade inflammation may also be a contributing factor for developing PCOS. Ashokarishta, Kumaryasava, Sukumaram Kashayam and Chandraprabha Vati also reduce low-grade inflammation, which ultimately reduces symptoms of PCOS and treats ovarian fluid filled cysts. Conditional difference is between Ashokarishta and Kumaryasava, which must be considered. Bone mineral loss starts occurring in women during menopause. It may also lead to osteoporosis. Ashokarishta plays a vital role in harmonizing the hormones and helps adapting the body with new changes that occur in the menopause. It prevents bone mineral loss. Calcium in the Ashokarishta helps maintaining bone mineral density. In some cases, when Ashokarishta used alone, it results in delayed menstruation. In such cases, the dosage should be reduced from 20 ml to 10 ml and should be taken along with Kumaryasava. The dosage of Ashokarishta is 10 ml to 20 ml twice or thrice a day. In heavy bleeding, your doctor may also ask to increase the dosage of Ashokarishta. Water is an adjuvant for Ashokarishta. You should add equal amount of water and Ashokarishta, then take immediately after meal. Some medicines are taken with Ashokarishta as per following rule. Ashokarishta is POSSIBLY SAFE and WELL-TOLERATED in most women. Some women may feel burning sensation after taking this remedy, but this side effect occurs only in women suffering with acidity or heartburn. The most common side effect of Ashokarishta is delayed menstruation. Ashokarishta may have effects on hormone levels, which may affect adversely in pregnancy. Therefore, pregnancy women should avoid using ashokarishta tonic. We consider it PROBABLY UNSAFE in Pregnancy. Lactating mothers can take ashokarishta if they experience heavy bleeding, leucorrhea or any other disease as explained above in therapeutic indication section of this article. It may not have adverse effects on mothers and breastfeeding babies. Instead, it contains good amount of calcium and promotes optimum health of bones and joints as well. Can women during perimenopausal period take Ashokarishta for heavy bleeding? Yes, Ashokarishta can help to reduce perimenopausal symptoms and heavy bleeding. Should I use Ashokarishta with normal water or hot water? Normal water would be best. How many days do we need to use Ashokarishta and Chandraprabha Vati for PCOS problem? My doctor has recommended Ashokarishta and Aloes Compound for my PCOS and irregular periods. Is it an appropriate treatment? How long will it take to cure my PCOS? It entirely depends on health conditions. Please read PCOS section in the article. Sorry for delayed reply, we had missed your comment. Please suggest if 5 ml Ashokarishta would help with same amount of water once a day after food in early heavy menstruation for 10 years old child. Ashokarishta can help for normalizing the menstrual flow, but the dosage should be 10 ml and preferably mixed in 50 ml water for child. In such cases, Mukta Pishti is also very helpful along with Ashokarishta. Does Ashokarishta help with uterine fibroids? Yes, along with Varanadi Kashayam, Chandraprabha Vati, Arogyavardhini Vati, Kanchnar Guggul and other medicines according to the Dosha and symptoms, Ashokarishta helps to treat the uterine fibroids. I am having excessive pain during periods and I have started taking Ashokarishta 30 days ago. But I missed my cycle this month. Don’t know why. I am taking once a day. What should I do? Should I continue taking this or stop taking it? Under such condition, you need to stop Ashokarishta and Kumaryasava would be the better option. I am suffering with PCOD and my cycle is irregular, so shall I take Ashokarishta for it? In the article, it is mentioned that side effect of Ashokarishta is delayed menstruation. I am taking Ashokarishta to help conceive, but will it also delay my periods if I do not conceive this month. I am not sure if Ashokarishta helps in conception, it is not indicated for this. Instead, Dashmoolarishta is the main medicine in Arishta & Asava Category used for infertility. Medicine should also be according to the underlying cause of infertility. In some cases of infertility in which we use Ashokarishta because they have heavy periods with short duration (in some cases, menstrual cycle repeats twice a month). To regularize the menstrual flow to the normal level, we use it for a month or two. Then we shift them on other medicines used for easier conception. However, if patient does not get benefits in normalizing (reducing) the heavy menstrual cycle, then we can also continue it along with medicines used for infertility, according to individual body type and Dosha Analysis. Side effects are not likely to mean it will appear in all patients. Some patients have these complaints. If you already have light menstruation, long periods or delay periods, Ashokarishta must not be used. My reports are all normal but still I am not able to conceive. I am in my early thirties, can you suggest an Ayurvedic medicine to may be improve egg quality. The best medicine for improving egg quality is PHAL GHRIT and ashwagandha churna with Misri. Can Phal Ghrit be taken with Dal or it needs to be taken strictly with milk and water only. Phal Ghrit should be taken with Misri mixing both in equal quantity, and then cow’s milk should be consumed. Will Ashokarishta help in case of recurrent miscarriages? Instead of Ashokarishta, Dashmoolarishta along with other herbs should be more beneficial. For more detail, Read it Here: Dashmoolarishta in Recurrent Miscarriage. Is it good for the treatment of leucorrhea? And how do I get it in Nigeria? Yes, it helps to treat leucorrhoea. Sometimes, hormonal imbalance is also responsible for leucorrhea in which Ashokarishta gives very good results. In addition, it also acts as antimicrobial and exerts astringent action, which treats underlying infections and reduces discharge. You can buy it online. Check it on Google to find the availability of Ashokarishta on any online store. Does the regular intake of ashokarishtha purifies our blood and brings inner glow on our face? Saraca Asoca is the main ingredient of Ashokarishta that purifies the blood and removes toxins from the body, so it is also likely to prevent skin diseases and improves the glow of the skin. Is safe or beneficial to taking Ashokarishta and Patrangasava and Mahayograj guggul in 2nd month of pregnancy? Pregnant women should not take Ashokarishta, Patrangasava and Mahayograj guggul. The safety profile of these medicines is not well-established. Mahayograj Guggul contains minerals derived from heavy metals, which are absolutely unsafe during pregnancy. Is beneficial to taking phal ghrit in the 2nd month of pregnancy? Tell me the ayurvedic medicine to help the right growth of the child and avoid miscarriage. Phal Ghrit is beneficial for improving the growth of developing baby in the womb. To avoid miscarriage, Ashwagandha Powder is more useful if there is a past history of miscarriage. I get recurrent boils inside labia minora around the time of starting my monthly cycle. These boils grow in size and eventually burst in 10 days. What Ayurvedic medicine can I take to cure them? My period was stopped last 3 months. Is Ashokarishta helpful for me to flow it again? The treatment of absent periods should be according to underlying cause. Please consult local ayurvedic physician. I am at 40 age. My period are not regular since last 7- 8 months,. Then I have to take the table to start up my monthly periods. Is there any role for ashokarishta in males? Yes, Male Patients can also take Ashokarishta for urinary disorders, edema and anorexia (loss of desire to eat). I have hair grown at chin because of PCOS (hormonal imbalance). My periods come 5 days earlier every month. Flow is not very heavy and remain for 3 days only. Should I take ashokarishta and chandraprabha vati? The combination of Chandraprabha Vati and Aleo Vera should be more helpful in this case. Can ashokarisht is helpful to improve the quality of egg? Yes, it improves ovarian functions and quality of egg. However, the better option for this is Ashwagandha Churna. Can ashokarisht is helpful after abortion? In my opinion, Ashokarishta is a wrong choice. Instead, Dashmoolarishta or Dashmool Kwath should be taken after abortion. I am suffering from PCOD. My periods are always irregular and delays for 4- 5 months sometimes. I checked this post and got idea about medicines ashokarisht and other which I can take. But I want to be sure. Could you please suggest which medicines or tonics I should take and how much amount or dosage? Ashokarishta will not work in PCOD if you have delay menstruation. The right medicine is Kumaryasava and Chandraprabha Vati. I am suffering from PCOS, I had delayed period problem, acne weigh gain and extra hair growth. I consulted with gynecologist, and taking some English medicines, then I heard about ashokarishta ayurvedic treatment. Please tell me how I should take ashokarishta and other medicines to treat my problem. Will it help me to get rid of PCOS? How can we use Ashokarishta for irregular periods? The main condition to use Ashokarishta is the prolonged mensuration and heavy bleeding. It can also be used in case of irregular periods when a patient has heavy bleeding and prolonged period when it comes. It is not the right medicine for irregular periods when patient get scanty periods or only spotting. In such case, Kumari Asava is the best medicine. I’m 23 yrs old I start taking ashokarista bcoz during my period there is only small stains….no heavy bleeding …. is ashokarista best for me? No, Ashokarishta will not help. Kumariasava may help. Should we take it regularly or just at a time of periods? I have small tumors in my Ovary. Dr operated once. Can Ashokarishta cure this problem? Please suggest. The better ayurvedic medicines for tumor in ovary are Chandraprabha Vati and kanchanar guggulu. Consult ayurvedic physician for more details. Hello sir. I have PCOS and my periods are scanty. A Dr. At BHU prescribed me Ashokarishta, manoll, hyponidd tablets and rajahpravartani vati. But you say Ashokarishta is not recommended for scanty flow. Should I continue? Do I defy the Dr.? Please ask your doctor. Kumariasava should be more beneficial.